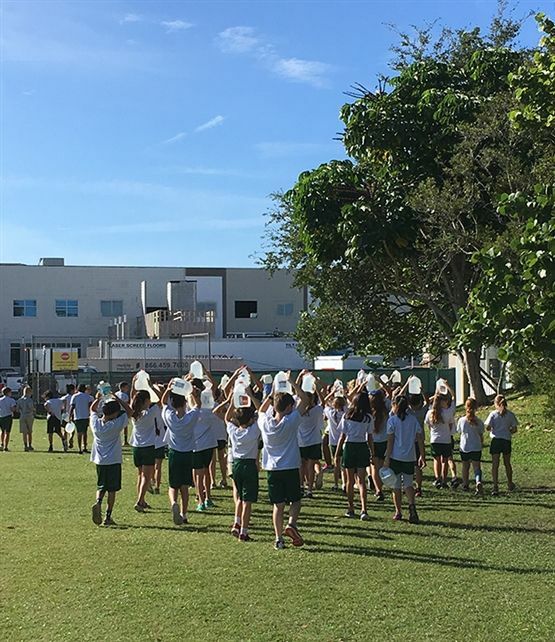 Fifth graders embarked on a Long Walk with Water around campus. Students are learning about the many women and girls in South Sudan who have limited education and job opportunities because of a lack of clean, running water in their communities. They have been reading “A Long Walk to Water” by Linda Sue Park in English class. The book’s main character is Nya, a girl who must trek to collect water daily for her family’s survival. The other main character is Salva Dut, one of the Lost Boys of Sudan, who escaped the massacre in his South Sudanese village as a boy. He became a refugee for over a decade in Ethiopia and later Kenya. As students walked around campus, they carried gallons of water, symbolizing the long walk Nya made to a pond twice daily to fetch water for her family’s survival. Students gained empathy with Nya as they walked, marvelling at the challenges she faced. They shared as they walked they were so happy to have shoes on that protected their feet as they walked. “At least we have shoes on and don’t have thorns poking into our feet!” Leila H. shared, recalling a detail from Nya’s story. Later in the walk, Brecken P. commented she was so happy for the running water she had in her life at school and at home. Fifth grade teachers have collaborated across the curriculum during this unit. Students have been learning about Africa in Social Studies, focusing on how humans adapt to the many challenging environments there. In Science, students have been researching waterborne illnesses and water filtration systems. They created their own water filters, scientifically testing the water quality before and after it ran through the filters. The water was from Crescent Lake, where the fifth graders participated in an invasive plant clean up with Keep Pinellas Beautiful. In Math, students will be measuring the weight of a gallon of water and comparing it to the weight of the water Nya might have carried in the Jerry cans used frequently by women and girls in South Sudan. This experience, paired with our visit by Peace Corps volunteer and Shorecrest alumna Sidney Wall ‘13, our study of the United Nations Sustainable Development Goals and Salva Dut’s organization Water for South Sudan, opened the students’ eyes to water quality issues that exist in the world. They gained both empathy and an appreciation for the many organizations that are making a difference in this area of the world.